Many today are unaware that the Bible has specific dates pointing to key events and as translations have come about through the years, the dates in the Bible have been increasingly left out or eliminated totally. As a result, many attack the credibility of the Bible for not having a citable date for critical events happening in our history. 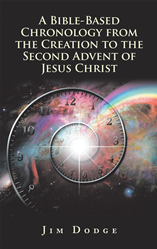 Author Jim Dodge’s new book, “A Bible-Based Chronology from the Creation to the Second Advent of Jesus Christ,” will prove to the reader these timelines and the history in the Bible, giving context and illumination to the special time in history. The book reveals three absolute dates that accurately link history from the Creation to the Second Advent of Jesus Christ: The first date, the year of the divided kingdom (930 B.C.) which enables an accurate chronology from the Creation to the Persian King Artaxerxes and links ancient Bible history with the Common Era. The second date (June 17, 2 B.C.) confirms a precise chronology for the life, ministry, death and resurrection of Jesus Christ that fits perfectly with scripture. Finally, the third date (May 14, 1948) marks the re-birth of God’s chosen people (Israel) as a nation and establishes the beginning of the Latter Days leading up to Jesus’ return. Jim Dodge earned a bachelor’s degree from the University of Oregon and a master’s in aeronautical engineering from Naval Postgraduate School. He also was senior officer in national security at Harvard. After retiring from the U.S. Navy as captain, he taught adult Sunday school classes at his local church. He also led small group Bible studies and served as the host of The Truth Project. He released The Christmas Star DVD in 2014 and has facilitated a prophecy Bible study at his church since 2013. Dodge considers “A Bible Based Chronology” the pinnacle of his Christian journey, which began when he accepted Jesus as his Lord and Savior at 16 years old. To learn more, please visit http://www.thechristmasstar.org.